Welcome to our website and to ENKO Ouaga International School (EOIS), a proudly African international school. Here you will find updated information about the day to day running of our school, our events and the programmes on offer but also discover what makes us special as a school. Our teachers have been carefully selected, are very well qualified and already share our values and perspectives. They believe in academic excellence via an inclusive, stimulating learning classroom experience within a nurturing atmosphere conducive to learning. We understand and appreciate the importance of relationships and are grateful for the involvement of parents in all aspects of our school. Together, we value the social, mental and physical well-being of every child. As an IBDP Candidate school, we aim to form internationally minded leaders who will display the IB learner profile characteristics so as to be able to genuinely call ourselves an International School. We strive not only to know and embrace but also to understand the complexity and beauty of multiculturalism. We practice progressive bilingualism and aim to think and reach globally as well as to act locally. As an African International school, we start by learning about ourselves, about Africa, in order to better understand others and the dynamic world around us. We realise the phenomenal task ahead, preparing this generation for a world of post truth, big data, Artificial Intelligence and professions that have not yet been created or dreamt of, a complex world of uncertainty. We understand that learning will have to be interdisciplinary, thinking creative and understanding conceptual and that the learner is to be ethical and their success purposeful. We are ready to respond to the 21st century’s educational challenge and welcome you to join us. 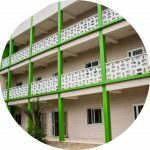 Bienvenue à Enko Ouaga International School ! Enko Ouaga International School, le tremplin vers les meilleures universités du monde. Enko Ouaga International School est un établissement du secondaire couvrant les classes de la 6ème à la Terminale et menant au prestigieux diplôme du Baccalauréat International, le diplôme de fin du secondaire le plus reconnu et valorisé par les meilleures universités du monde. Enko Ouaga combine un programme international de grande qualité et des conditions d’apprentissage optimales, afin de permettre le développement et l’épanouissement académique, social, culturel et moral de chaque élève.